Sales success is about managing key metrics and behavior indicators. When you can systematize your selling efforts, your salesforce will be more consistent and effective. Today’s post is by Bill Bartlett, author of The Sales Coach’s Playbook (CLICK HERE to get your copy). I witnessed an interesting phenomenon last week when I was working with a client who is a business owner. He had asked me to observe a coaching session/business review he was conducting with his sales manager. The objective of the one-hour session was to determine why the salesforce was not meeting its quota and develop an action plan to resolve it. He began by admonishing the manager for the unacceptable shortfall in meeting his quota. He warned him that there would be serious consequences if it was not remedied the following quarter. For the first forty minutes of the hour, he reviewed facts and figures to support how severely it would impact not only the bottom line, but also his and his peers’ bonuses. He then devoted the remaining twenty minutes to listening to the manager provide solutions to this “crisis.” Instead of proposing suggestions, however, he responded with a litany of excuses beyond his control, such as the market’s volatility and flattening substantiated by data he had brought with him, the company’s pricing as compared to their competitors, and the loss of major accounts because their buying patterns had changed. He closed the coaching session by committing to “forcing” the sales team to work harder to remedy the shortfall, assuring the “future would be different.” My client seemed satisfied, dismissed his manager, and turned to me with a sense of gratification. He asked for my feedback and was taken aback when I predicted nothing would change in the future and sales would continue to stagnate. I commented that the meeting was clearly not a coaching session. It was a one hour session that drove fear into the heart of his manager who evidently did not know how to modify his team’s results. Furthermore, I observed that the manager’s self-worth had been damaged and to regain some modicum of self-respect, he would predictably communicate to his sales team in the same way that my client did with him. My client sat back in his chair and wanted to know how he could have conducted the meeting to assure a meaningful and measurable turnaround in results. The top ten behaviors should be routinely rated on a scale of one to ten. I do this as an integral part of my selling and managing “DNA.” A manager, and each member of his sales team, should perform an independent rating of their performance of each of the ten behaviors, realizing that there will be a gap between them. The manager’s primary objective is to communicate to the sales team that any rating in any of the behaviors under a seven must be modified to achieve this minimally acceptable level. Note that even though any disparity in rating will be explored or debated, the manager’s “final” rating prevails in this exercise. 2. The manager should establish five Key Performance Indicators (KPIs) that are reviewed weekly. They become the standard to measure how effective salespeople are in executing the ten behaviors. Some of the KPIs I utilize are: number of first face-to-face meetings with prospects, total weekly hours spent prospecting, qualified proposals presented to prospects, and weekly flow of revenue. 3. 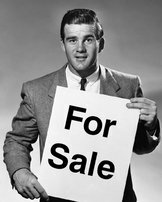 Once a quota has been agreed upon, the salesperson owns that number as a commitment to the business. To minimize unacceptable excuse-making, I recommend the “more, better, and different” method to maximize behavior modification and results. When a manager observes a salesperson struggling to hit quota markers, a coaching session is conducted to identify which of the ten behaviors he or she must do more of to reverse the trend. This may involve evaluating the value in increasing their selling output, for example. To combat a downward trend, better execution of weak behaviors must be performed. This may require the manager training the salesperson on what “better” behaviors look like. The third area entails the salesperson incorporating different methods of executing behaviors that will impact results. Bottom line: The sales manager commits to behavior modification as the key to consistent sales success and minimizing unproductive excuse-making. 4. The sales manager should compile a list of all key sales calls scheduled for the week and brief and debrief the plans for the call. Pre-call, call, and post call activities should be systematically followed to identify and/or remedy positive and negative patterns. This will be a challenge if the salespeople are not utilizing a selling system and resort to “winging it” to succeed. 5. Regular coaching sessions should be scheduled with each salesperson. It is imperative that a coaching methodology be used during these sessions to avoid dissolving into “rah-rah,” pseudo-motivational, and fruitless exercises. Done properly, coaching sessions enable managers to address beliefs that may be holding salespeople hostage from attaining results. Instilling fear and pressuring underperforming salespeople are never productive or effective solutions to sales problems business owners face today. Using such tactics may only result in their experiencing a false sense of security as any immediate improvement is rarely sustained. Sales executives should focus on the following equation to ensure success: Hire the right salespeople + determine the top ten behaviors that impact the bottom line + establish KPIs to measure the effectiveness of the behaviors’ execution + coach for higher performance = success. 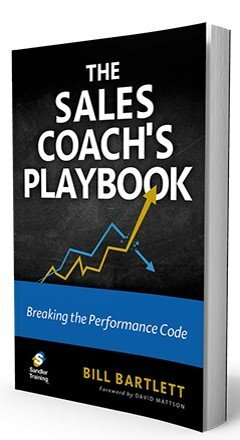 – Bill Bartlett is author of The Sales Coach’s Playbook: Breaking the Performance Code (Sandler Training, 2016). Bartlett is an experienced Sandler trainer who plays an important role in Sandler’s worldwide organization and is recognized as a business development expert specializing in executive sales training and sales productivity training. He currently heads a Sandler Training center in the Chicago suburb of Naperville, IL. For more information, please visit https://www.sandler.com/resources/sandler-books/coaching.